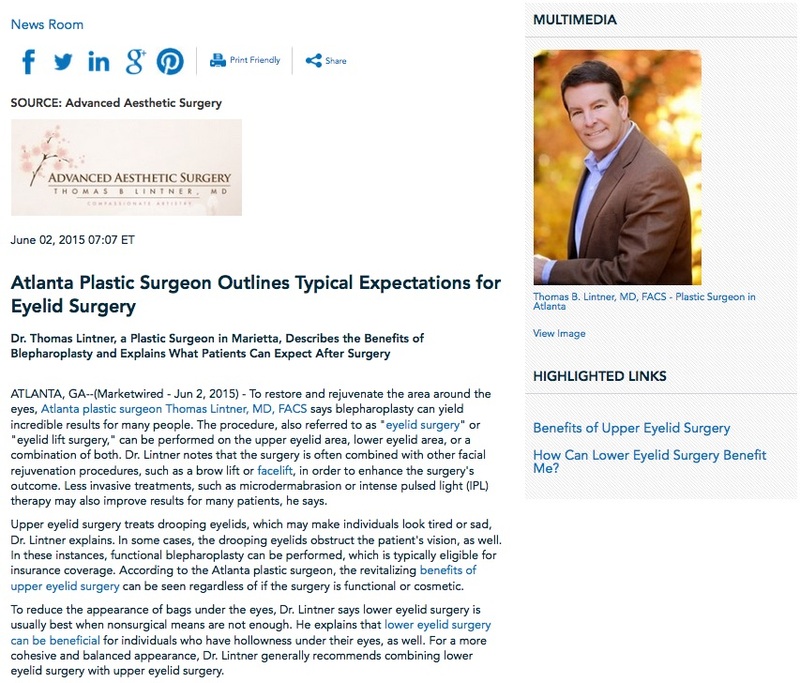 Dr. Thomas Lintner, a plastic surgeon in Marietta, describes the benefits of blepharoplasty and explains what patients can expect after surgery. Atlanta, GA — To restore and rejuvenate the area around the eyes, Atlanta plastic surgeon Thomas Lintner, MD, FACS says blepharoplasty can yield incredible results for many people. The procedure, also referred to as “eyelid surgery” or “eyelid lift surgery,” can be performed on the upper eyelid area, lower eyelid area, or a combination of both. Dr. Lintner notes that the surgery is often combined with other facial rejuvenation procedures, such as a brow lift or facelift, in order to enhance the surgery’s outcome. Less invasive treatments, such as microdermabrasion or intense pulsed light (IPL) therapy may also improve results for many patients, he says. Upper eyelid surgery treats drooping eyelids, which may make individuals look tired or sad, Dr. Lintner explains. In some cases, the drooping eyelids obstruct the patient’s vision, as well. In these instances, functional blepharoplasty can be performed, which is typically eligible for insurance coverage. According to the Atlanta plastic surgeon, the revitalizing benefits of upper eyelid surgery can be seen regardless of if the surgery is functional or cosmetic. To reduce the appearance of bags under the eyes, Dr. Lintner says lower eyelid surgery is usually best when nonsurgical means are not enough. He explains that lower eyelid surgery can be beneficial for individuals who have hollowness under their eyes, as well. For a more cohesive and balanced appearance, Dr. Lintner generally recommends combining lower eyelid surgery with upper eyelid surgery. After blepharoplasty, patients often experience some bruising and swelling. To combat this, Dr. Lintner advises most patients to apply ice packs to the area for about 10-15 minutes at a time during the initial healing period. After 48 hours, he usually recommends for patients to switch to using warm compresses on the eyes to promote a more rapid recovery. For the best possible outcome, Dr. Lintner stresses that patients should always follow the specific aftercare instructions provided by their board-certified plastic surgeon. Although each patient will have a unique recovery plan that is best for them, Dr. Lintner reports that most patients should be able to return to their daily activities approximately ten days after eyelid surgery. However, he says more strenuous activities should be avoided for about three weeks. Overall, Dr. Lintner encourages individuals considering blepharoplasty to consult an experienced, board-certified plastic surgeon. He also reminds patients that eyelid surgery may not be right for everyone, and stresses the importance of a consultation with a board-certified plastic surgeon to determine candidacy and review alternative options, if necessary. Dr. Lintner is the medical director of Advanced Aesthetic Surgery, his plastic surgery practice in the Atlanta area. A Georgetown University graduate, Dr. Lintner earned his medical degree at Emory University School of Medicine, where he also completed his general and plastic surgery residency programs. He is a Fellowship-trained, board-certified plastic surgeon, and is a member of many esteemed medical organizations, including the American Society of Plastic Surgeons, the American Society for Aesthetic Plastic Surgery, and the Medical Association of Georgia. To learn more about Dr. Lintner and his practice, visit tomlintnermd.com and facebook.com/tomlintnermd. Dr. Lintner is available for interview upon request.